Still tasty, even at the end of the season. April 2014. The initial two trees were sold as dwarf varieties, but I’ve now come to realise that dwarf apple trees can still grow pretty bloody big. Both trees have been particularly vigorous and were wonderfully bountiful last year. The apples were tasty in February, but had started to discolour by April, at which stage we had them stewed and accompanied by ice-cream for desert. 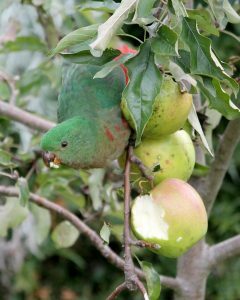 The fruit was even more popular with the local birds, with currawongs, bowerbirds, indian mynors and king parrots all having a go at them at various times. The dual variety tree has been in for two years, but has yet to produce fruit. Both leaders have headed straight up, with only a few tiny branches showing thus far. Something had a go at ring-barking one of the leaders last autumn (a cockatoo or other bird with a taste for young bark I guess), but other than having an indentation 240° around the lower trunk, the tree seems to have survived. I gave both leaders a pruning one third down in July, so hopefully the tree will be more inclined to branch out into an apple tree shape this spring.